Jenner Headlands Preserve Public Access | Prunuske Chatham, Inc.
PCI was retained by the Wildlands Conservancy and Sonoma Land Trust for planning and design of initial public access features for this 5,630-acre Preserve. 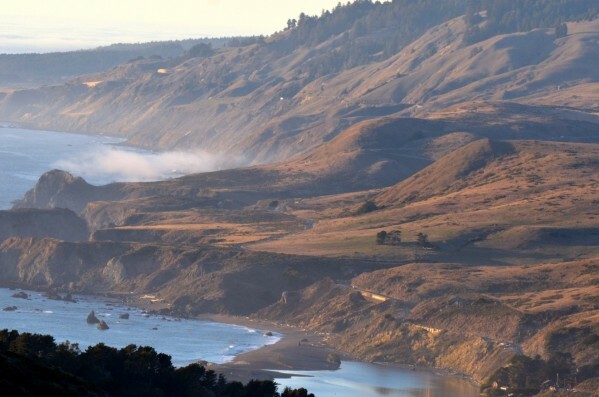 The project involves the creation of a trailhead parking lot off Highway 1 north of Jenner, ADA-accessible restrooms and day-use area with picnic tables, ADA compliant access road and trail to trailhead, interpretive signage, kiosks, wetland enhancement, and a restored drainage. The proposed 30-space, two-tiered parking lot, which is designed to blend in with the natural topography, allows for bus parking and emergency vehicle access. Storm water runoff will be retained onsite and infiltrate into a constructed bio-swale and infiltration basin. PCI has been involved in the design and planning of the project from the concept stage through completion of final construction documents. The project is currently in the permitting and CEQA compliance stage, and PCI plans to provide construction oversight. In addition to the design, planning and regulatory compliance, PCI completed the biology studies, wetland delineations, visual analysis, managed cultural resource assessments, assisted with community outreach, and prepared construction cost estimates.